Product #60818 | SKU FW1018SPV1 | 0.0 (no ratings yet) Thanks for your rating! Featuring a large screen, 1920 x 1200 resolution, and many image analysis tools, this monitor allows you to frame your shots with accuracy. The FeelWorld 10" 4K IPS Professional Field Monitor features a large screen, 1920 x 1200 resolution, and many image analysis tools, and allows you to frame your shots with accuracy. It features 1/4"-20 mounting threads so you can attach it to your camera or camera rig, and it comes with a U-bracket so you can use it desktop-mounted. A sunshade is also supplied that lets you confidently monitor your image outdoors. The monitor features SDI, HDMI, and analogue inputs and outputs, audio and tally inputs, and a headphone jack and speaker. 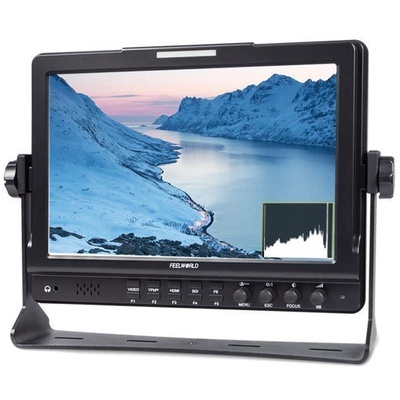 It supports up to DCI 4K resolution signals at 24 fps via the HDMI input and up to 1080p60 via the 3G-SDI input. Up to six of the image analysis tools can be assigned to function buttons on the front panel. An L-series battery plate comes included with the monitor but can be switched out for optional LP-E6, D28S, V-mount, or Gold mount plates.